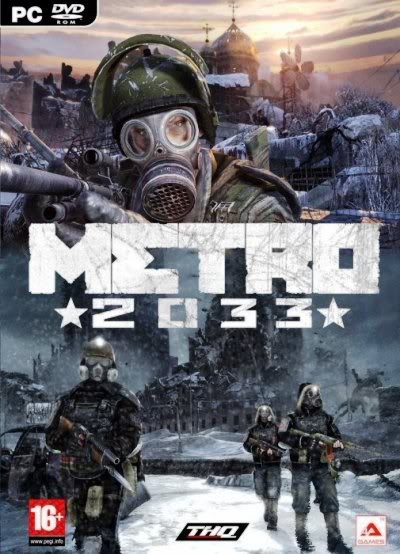 Metro 2033 - The atmospheric first-person shooter, created based on the bestseller Dmitry Glukhovski. Game "Metro 2033", which the unfolding events in the devastated post-apocalyptic Moscow subway - is a dismal story of survival of the hardest, where the fate of humanity is in your hands. You - Artem, ordinary Muscovite, born before the world of the apocalypse, but grew up in the ground. Never before had he not leave the limits of their own, have become home to him the subway station, but fate decided differently. Now he has to fulfill the mission of his life: to get into the center of Moscow Metro, and warn the remnants of human society of the impending danger, or die in transit and to condemn the survivors to certain death. "Metro 2033 - is a breathtaking atmospheric first-person shooter, wrapped in a shell-art graphics. Feel devastated post-nuclear Moscow! "Witness the daily horror that is experiencing a society, living underground in constant fear. "Take heart, and become researchers network of underground tunnels, which spread throughout the city. There in the darkness you are the prey of mutants, but not vice versa. Become a hunter or a victim. "Explore the radiation-ravaged city. From the infected world and mutated creatures, awaiting you outside, save only a mask and a faithful rifle. "Give your psyche in order and prepare to meet with all the horrors of post-nuclear world of the universe" Metro 2033 ".